Who doesn’t love a really great fried chicken sandwich? 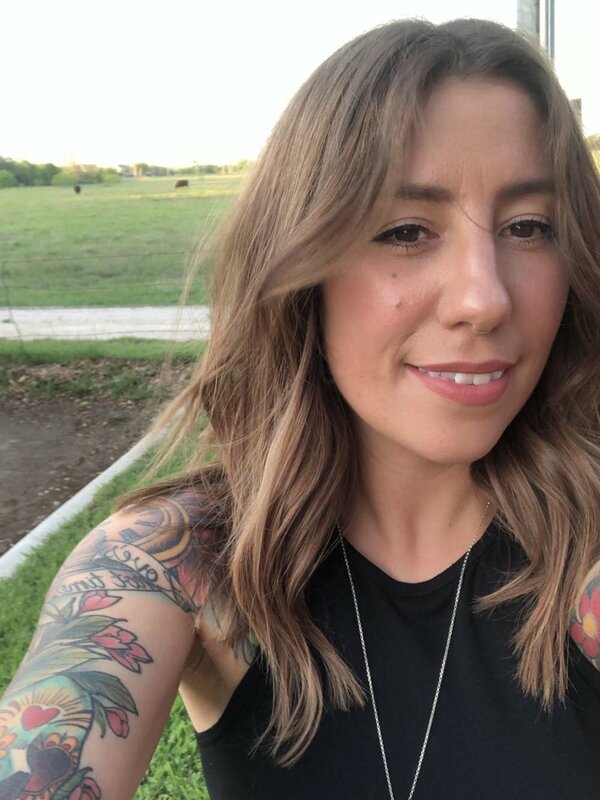 I mean, come on. What’s not to love about a crispy, crunchy, juicy, spicy piece of bird that is fried to perfection sitting on a soft brioche bun with crunchy pickles and tangy slaw? I’m literally making my mouth water all over again. These sandwiches are that and MORE. I threw up a poll in my Instagram stories on Monday in an attempt to gauge what my followers wanted to see me make and both were hot contenders, but the fried chicken sandwich took the cake. And boy am I glad that it did. These were giant, messy sandwiches in the best way possible. You know the old Carl’s Jr. adage, “If it doesn’t get all over the place, it doesn’t belong in your face”? If we are following those standards, these definitely belong in your face. So what makes these sandwiches specifically Korean? Don’t get me wrong, these are like American-Korean fusion sandwiches and are in no way “authentic”. However, I wanted to incorporate some classic Korean ingredients which really look these sandwiches to the next level. First, there’s kimchi in the slaw. Kimchi is delicious fermented cabbage which is equal parts tangy and a little spicy. It’s got tons of probiotic benefits but most importantly, it’s just super tasty and really adds something to an otherwise classic slaw. The sauce. This is really where the magic is. 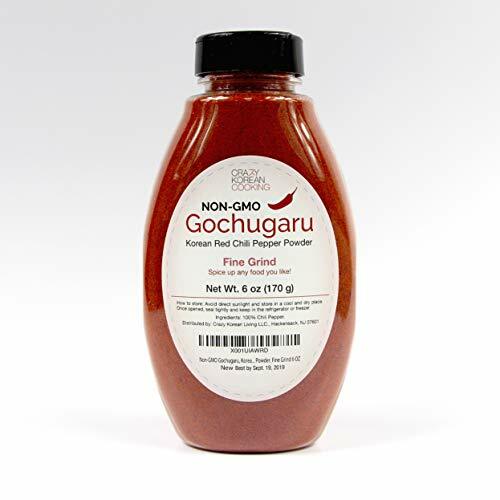 The sauce is like a sweet, tangy and spicy glaze that utilizes both gochugaru (Korean chili powder) and gochujang (korean chili paste). Neither of these ingredients are too spicy, but they have a little heat and tons of flavor. The pickles are really similar to the little cucumber salad you would munch on in a Korean bbq restaurant as part of the banchan, a collection of small sides served alongside Korean bbq. It may seem like there’s a lot of work to this recipe, but I swear it’s easy. You can make the slaw and “pickles” ahead of time. Marinate the chicken in the morning and then when you get home all you have to do is fry the chicken and make the sauce. 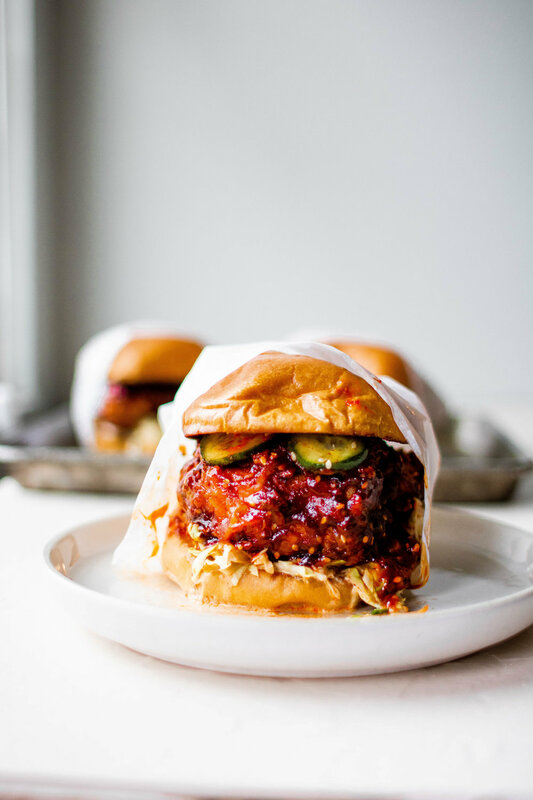 Excellent fried chicken sandwiches make a great weeknight meal, let me tell you! For the fried chicken: Using a flat meat tenderizer, gently pound the fatter part of the chicken out so that the breast is uniform thickness. Cut the chicken in half. Repeat with the other breast. Whisk together the buttermilk, egg, fish sauce, sriracha and ginger together and pour the mixture into a gallon ziplock bag with the chicken. Marinate for 2-8 hours. In a separate gallon ziplock bag, add the flour, potato starch, gochugaru, ginger, garlic and salt. Shake to mix the ingredients together well. After the chicken is done marinating, transfer the chicken pieces to the flour, allowing any excess buttermilk to drain off. Seal the bag and shake really well to coat all the chicken pieces in flour. 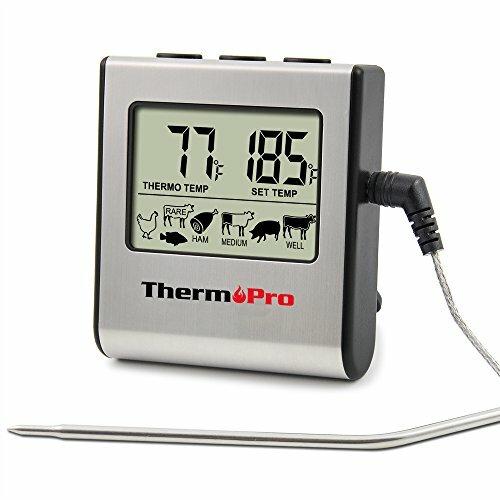 Heat at least 2-3" of canola oil in a heavy bottomed pot or dutch oven to 360 degrees F. Gently lower 2 pieces of chicken into the oil and fry for about 7 minutes, flipping once, until deeply golden brown and a probe thermometer registers 165 degrees F. Transfer chicken to a wire rack set over a baking sheet. Repeat with the other two pieces. While the chicken is still warm, drizzle or brush the sauce liberally all over the chicken. For the sauce: Combine all the ingredients in a nonstick skillet and simmer until thickened slightly to the consistency of a glaze. Set aside. For the slaw: Combine all the ingredients, cover, and chill until ready to use. Can be made 1 day in advance. For the pickles: Combine all the ingredients, cover, and chill until ready to use, Can be made 1 day in advance. To assemble: Lay slaw on the bottom bun of a toasted brioche burger bun. Top with chicken and pickles and top bun. Serve immediately. 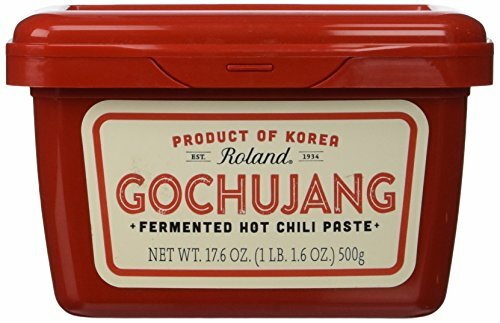 Gochugaru is a korean chili powder and gochujang is a korean chili paste, both are essential to the recipe and can be found at most Asian grocery stores or on amazon (I've linked the products above).